Wilde successfully helped Eminox to assess an SCR system through analytical testing, in line with the requirement to provide a fixed-term product warranty. Eminox is an original equipment supplier of exhaust after-treatment systems, including SCR systems, as well as retrofit systems supplied across Europe. In diesel engines, Selective Catalytic Reduction (SCR) systems are used to convert harmful nitrogen oxides (NOx), found in exhaust gases, to harmless mixtures of water and nitrogen. The need for analytical testing of these systems stems from the requirement to provide fixed-term product warranties. Where physical product life cycle testing is not practical due to time restraints, analytical methods are used in conjunction with and are validated against an accelerated life cycle physical test. Correlation between the physical and analytical accelerated life cycle tests then allows for the total design life to be estimated using analytical methods. 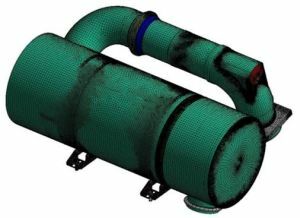 Wilde helped Eminox assess the system’s design life by performing a modal analysis, followed by a series of random vibration PSD analyses. Damage ratios were then calculated for critical locations within the system using Steinburg’s three band method for cumulative damage. The resonant frequencies and associated mode shapes obtained from the modal analysis correlated well with those predicted by physical shaker testing. The Accelerated Lifecycle PSD results correlated directly with observations from the physical testing, further increasing confidence in the analytical results. 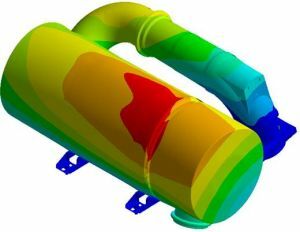 Working with Wilde on this and many other projects, Eminox has been able to develop the effective use of FEA and enhance their in-house capabilities. We always appreciate Wilde’s approach as working with them is very beneficial for us, both in terms of project costs and knowledge transfer. They are very open about the results, barriers and difficulties involved, and do their utmost to make sure that the models are validated, which not many other companies would do. Wilde go to great lengths to produce the accurate results we need and that’s why we have developed a successful working relationship.